Mystical settings, powerful crystals, giant spiders and feisty elves – what more could a kid ask for? Children aged 10 and over will find all these magical marvels plus more in the recently launched Bethloria series. The first volume, Firelight of Heaven, introduces the two main characters, orphaned brothers Robbie and Dougray. We know little of their parents, except for hints that there are dark secrets in their past. The book’s point of view switches between the brothers, giving us a deeper understanding of the characters and their touching but angst-ridden relationship. In this book, the brothers are forced to flee from danger. 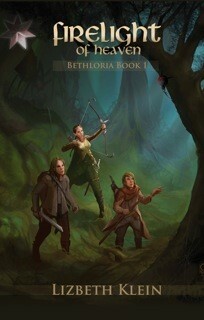 They meet up with Belle, an elf girl, and commence their quest to locate the seven crystals of the Morning Star. If they fail, the Black Kingdom will cover the woods and permanent darkness will fall. The story interweaves elements of faith, loyalty and trust into an action-packed read. Published by Australian publisher Wombat Books www.wombatbooks.com, this series promises to be popular with boys and girls alike. This is Lizbeth Klein’s first novel. 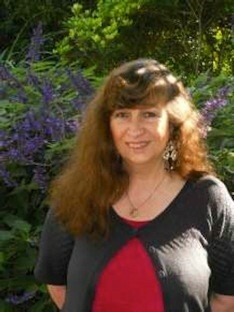 She has written educational material as well as short stories published in anthologies. Lizbeth has 19 years’ experience as a primary school teacher, and has tutored both primary and high school students in English. As such, she is well-placed to know what appeals to children. You can read more about her on her website, www.bethloria.com. Reading this reminds me of that old Disney feature, “The Black Cauldron” and Jim Henson’s, “The Dark Crystal”. I imagine that “Bethloria” isn’t as dark as, “The Black Cauldron” with demons in it? My boys love “The Black Cauldron” but it’s frightening. My boys are not quite Tweens. Is it a teen read or younger? Hi, thanks for your query. This story is dark with aspects of spiders and gloomy forests, but if your children loved ‘The Black Cauldron’ and ‘The Dark Crystal’, this tale will really appeal to them.